Alan was born in 1957, the son of an RAF officer, and educated at Beechwood Park School, Herts, and Merchant Taylors’ School before going on to read Politics and Economics at St John’s College, Oxford. Elected President of the Oxford Union in 1979, Alan went on to win a Kennedy Scholarship at Harvard University following an initial period working for Shell. After living in Singapore between 1984 and 1986 and travelling widely during his time as an oil trader for an independent commodity company, Alan returned to contest the Barnsley West and Penistone seat in the 1987 General Election, before being elected for as MP for Rutland and Melton in 1992. He was subsequently re-elected in 1997, 2001, 2005 and 2010. Having spearheaded William Hague’s successful campaign for the Conservative leadership in 1997, Alan went on to hold a raft of Shadow Cabinet positions and become renowned as a modernising force within the party, encouraging a more socially and economically liberal approach. A respected voice on the Middle East within the party, Alan continues to travel extensively in the region. As the first ever openly gay Conservative MP he was at the forefront of the party’s efforts to enact the Civil Partnership Bill. 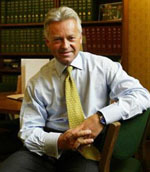 Following the formation of the Coalition Government in 2010, Alan was appointed Minister of State for International Development, with a remit covering the Middle East and Asia and relations with the UN, EU, IMF and World Bank. © The Biz Club 2019.